When you receive your first few pay checks it can be tempting to use your credit card and splash out on all sorts of treats. While there’s no harm in treating yourself for your hard work, it’s important to think to the future too, rather than just living for the moment. So it’s a good idea to split your income in to three separate groups – essential outgoings, non-essential outgoings and savings. Firstly, work out how much you definitely need to spend each month on things such as rent, bills and food. From there you’ll be left with a sum to use on everything else, such as entertainment and other treats. If you’re stuck, why not follow an online guide to budget planning? Once you’ve been realistic about your spending, consider transferring a percentage of your income to a savings fund. Not only will this prove useful if you fancy taking a holiday or making a big ticket purchase, it’ll also cover you for emergencies. It’s also, regardless of your age, worth thinking about your retirement. Find out if your employer offers a pension plan as these can often have a number of benefits attached to them. 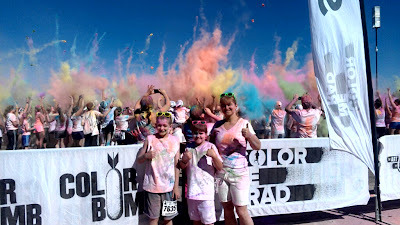 Our Summer in Pictures - Checking Things Off Our Summer Bucket List! Where has the summer gone? Seriously, how is it already coming to an end?! 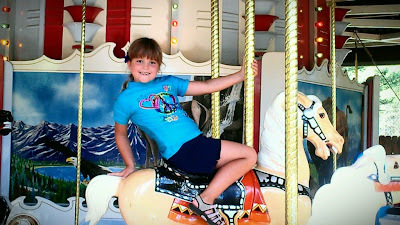 There are only a couple of days left of summer vacation, and we have made a ton of wonderful memories! I'm happy to say that we managed to successfully check off 27 things from our Summer Bucket List. Not too shabby, if I do say so myself. Of course there are a few things that we just aren't going to be able to do this summer, but we are still young and will get to them sooner or later! I'll admit that I'm not ready for the kids to start back to school on Monday, but I know it's out of my control. We had a great summer vacation and enjoyed every minute of it! I'm already planning our family vacation for next summer! When I started blogging, I had no idea what I was getting my self into. 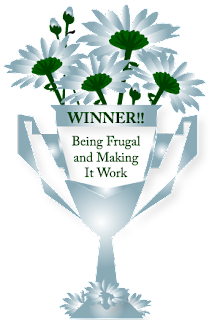 I knew that I wanted my readers to enjoy what I shared, and that I wanted to focus on what I love - being frugal! I didn't have any real expectations or goals when I began, but it sure has exploded! As I became more comfortable with my blog and how it worked, I began to notice that other blog designs were very focused on getting their web design perfected. Having a website or blog that is user-friendly, easy to navigate, and looks professional is plays a vital role in its success! Photos, logos, SEO, content, web design, social media... there is so much to learn. I don't claim to know everything and I doubt I ever will, but I'm learning new things on a daily basis. 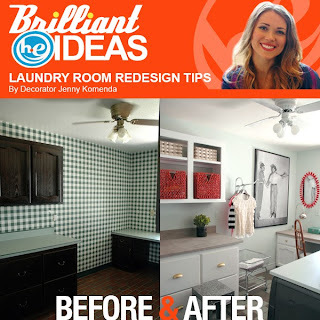 I try to incorporate as many new ideas and designs on my blog as I can to keep my readers coming back for more! With back-to-school less than a week away, the thought of school lunches is on the minds of many moms. Wanting to make sure that my children have healthy, fun lunches is always a top priority. Wholly Guacamole is moving out of the bag and into the tray, saying goodbye to the bag and hello to new easy peel trays! I love that these new fun, 100 calorie, portable cups are perfect for packing in my children's lunch boxes. Nothing smells as sweet as a beautiful bouquet of fragrant flowers. I love having a vase of flowers in the house because they always make the house smell so good, and brightens my day. 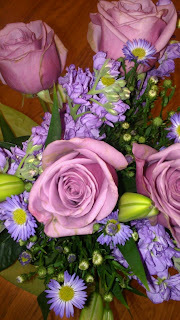 I recently received a beautiful lavender rose and lily bouquet from From You Flowers. This beautiful flower arrangement was shipped directly from the grower and arrived in bud form, allowing me to fully watch and enjoy the flowers bloom. The purple roses were paired with seasonal purple flowers and gorgeous pink stargazer lilies. Did I mention that purple is my favorite color? The flowers were beautiful, fragrant, and lasted nearly 2 weeks. I made sure to change the water every couple days, and I think that helped them last longer. My family doesn't drink much soda, but there are times when an ice cold soda pop really hits the spot. I can't eat pizza without an ice cold glass of soda... there is just something about soda and pizza that goes together like peanut butter and jelly! I've partnered with Tricia from the Night Owl Mama and some fantastic bloggers to bring you this fantastic giveaway sponsored by Soda Stream. What better way to end the day than by announcing some lucky giveaway winners! 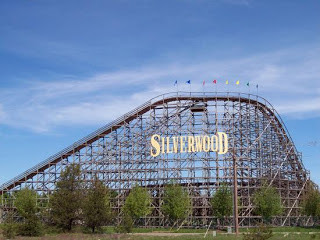 One very lucky Being Frugal and Making it work reader is going to receive my most popular giveaway prize EVER... a family 4 pack of tickets to Silverwood Theme Park. This contest received over 500 blog comments and 16,793 total entries! Are you one of today's lucky winners? Do you love your Keurig as much as I love mine? 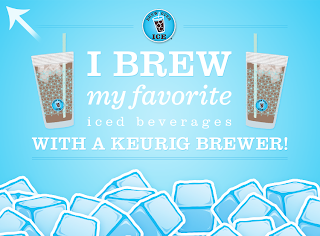 Have you entered the "Brew Over Ice Sweepstakes" yet? Play every day for your chance to win instant daily prizes and the $10,000 grand prize. You're an Instant Winner! You have won either a Brew Over Ice Sampler Pack OR Tumbler and have been entered for a chance to win the $10,000 Grand Prize. Don't forget to download your $2 off coupon and watch their Brew Over Ice video. 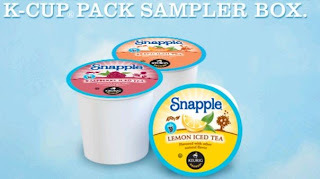 In addition... be sure to grab your Free Snapple Brew Over Ice K-Cup Sampler Pack while supplies last! If you are anything like me... coffee is the way you like to start your morning, and without your morning cup - your day just isn't going to be the same! In the winter I prefer hot coffee and in the summer I want iced coffee. Can you relate? Up until last summer I made my morning cup of coffee in a traditional twelve cup machine, generally more than half of the pot would end up going down the drain at the end of the day. Then my husband and kids bought me a birthday present that would change my life forever... a single cup Keurig brewer! The thing that makes the Keurig® brewer stand out from the rest is that you're not committed to just one kind of coffee - in fact, you aren't even tied down to hot coffee. 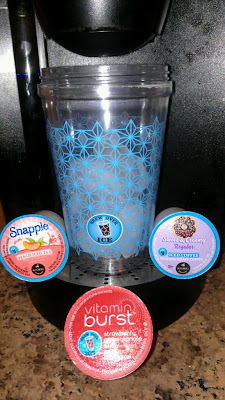 My kids are hugs fans of my Keurig because I can get hot chocolate k-cups for them to enjoy! Just when you thought your Keurig experience couldn’t get any better… their Brew Over Ice K-Cups introduce an entirely new way for you to enjoy your Keurig. Now you can relax and rejuvenate with a wide variety of refreshing iced coffees, teas, and fruit brews at the simple touch of a button. 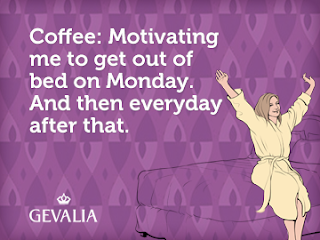 Do you own a Keurig? Head on over to the Brew Over Ice Facebook page, watch a short video and click redeem for a Free Snapple Brew Over Ice K-Cup Sampler! 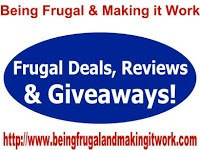 Be sure to check Being Frugal and Making it Work later this afternoon and enter my Brew Over Ice Prize Pack giveaway valued at nearly $90! Over the past few weeks I have had a little more time to enter blog giveaways, and it paid off this week. Not only did I win one giveaway - I won three! I ended up winning a very col fireworks prize pack, a $50 restaurant gift card and a Tervis tumbler. 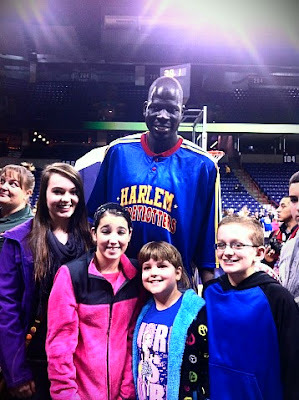 Earlier this year, we took the kids to see the Harlem Globetrotters for the very first time. We loved it so much and can't wait to see them again when they come back to town! This week, The Harlem Globetrotters launched a brand new Fan Ambassador program called HG MVP. MVPs will receive exclusive Globetrotter content, gain access to MVP-only events and material, and will have opportunities to win prizes available ONLY to HG MVPs. Prizes like tickets, merchandise, autographed memorabilia and special once-in-a-lifetime opportunities. This month's prize is called "Put Me in a Globetrotter Video" sweepstakes where one fan will star in the next Globetrotter YouTube video with our players. Get cool stuff and win awesome prizes! Become a Harlem Globetrotters MVP today! Anybody age 13 and above is eligible to join and win the monthly prize(s) so if your children are of age and are Globetrotter fans, they can join too. As a mom, it is important that my family's clothes are clean, stain and static free and smell fresh and clean. It is also very important that the scent is not too strong or overpowering, especially for my son and husband. 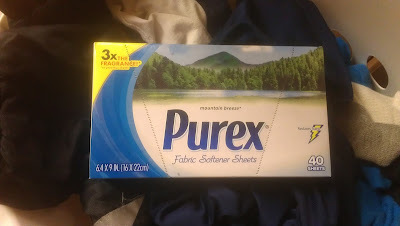 As a Purex Insider I was recently given the opportunity to try Purex Fabric Softener Dryer Sheets in Mountain Breeze scent; they are also available in Sweet Lavender. Imagine my surprise when I learned that these great smelling dryer sheets also reduce static cling and repel pet hair and lint. With two very large dogs as part of our family, I was thrilled! Add freshness and softness throughout your entire household with Purex Fabric Softener Dryer Sheets! Purex Fabric Softener Dryer Sheets don’t just reduce static cling and leave my family’s laundry soft and smelling fresh: they can also keep my whole house smelling fresh! 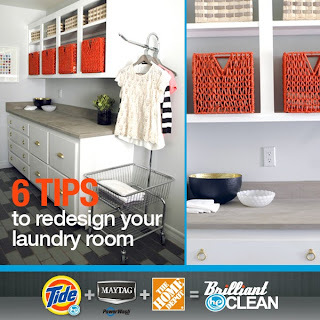 Just choose your favorite fragrance and tuck a sheet in hampers, in the linen closets, gym bags, shoes, dresser drawers, and any other laundry storage areas. My 12 year old son is a wrestler, so I'm sure you can imagine how his clothes smell after practice or a tournament. I keep a Purex Fabric Softener Dryer Sheet in his wrestling bag and in his closet for extra coverage and freshness! It works wonders and makes a world of difference. The Being Frugal and Making it Work family loves Wholly Guacamole. Of course we love their variety of guacamole products, especially their new minis because they are perfect for snacking and school lunches. We also love their line of salsa. Use Wholly Guacamole minis and a little creativity to make lunch fun! The best lunches will win a lunc box full of guacalicious products and a gift car for $100! Milkshakes and ice cream are two of our favorite summertime treats, but enjoying such treats can often be expensive when you have to purchase one for each member of the family. That's where Sonic Drive-In comes in and saves summer! 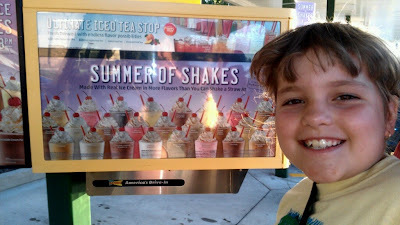 Have you heard about SONIC’s Summer of Shakes, featuring 25 different milkshake flavors to choose from? Each delicious flavor is hand-mixed with real ice cream and topped with whip cream and a cherry! They are thick and delicious, full of flavor! 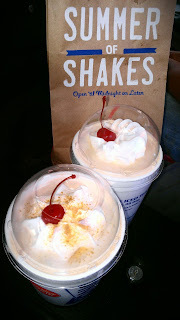 To make it even sweeter... SONIC shakes are half price after 8 pm all summer long. I will admit that we have already been to Sonic seven or eight times (maybe more) to enjoy this special deal and yummy summer treat. A few times as a family, once with the grandparents, twice with friends, and once with the cousins! I've had cherry cheesecake, strawberry cheesecake, chocolate cheesecake and Oreo cheesecake... Yes, I love cheesecake! My favorite? I'm going to go with Oreo cheesecake! 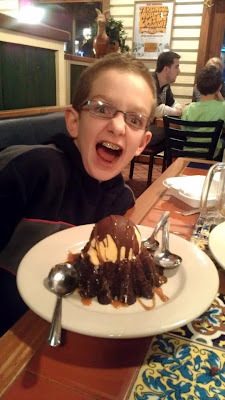 My 12 year old son has tried a few different flavors, but hot fudge is his favorite. My 9 year old daughter's two favorites are peanut butter and peanut butter fudge. My husband is a dare devil and has had both vanilla and chocolate! We always talk about the peanut butter and bacon milkshake, but we are all too afraid to order it! I know we can't say we don't like it if we don't try it - but I just don't think we are brave enough! We are a busy family and always keep a small bag full of healthy snacks in the vehicle at all times. Between running to camps, sporting events, and just everyday activities, having a snack handy means less " fast and convenient" stops, which often lead to unhealthy snacking. Two week ago we headed out on our summer vacation, which starts with a 9 hour road trip. I was thrilled when my package of Simply Snackin snacks arrived the morning of our departure. They were the perfect healthy snack to accompany us on our journey to the beach. 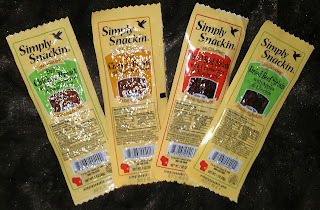 Simply Snackin gourmet dried meat snacks are the ideal high protein, low calorie snack (60 calories) for children and adults. Although often referred to as “jerky,” Simply Snackin delivers an experience unlike any other conventional jerky — bite after bite of moist, lean, savory chicken breast or beef sirloin is paired with flavorful mangos, apples, blueberries and other artisan ingredients. 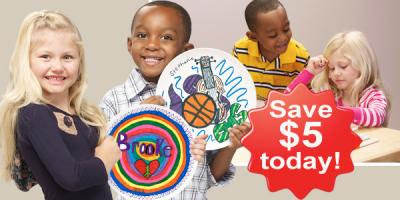 Make A Plate Art Project: Save $5 - "Makit" the Perfect Gift for any Occasion! Guess what the grandparents are getting for Christmas this year! 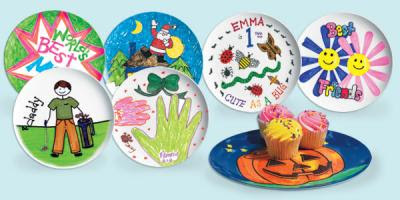 Make A Plate will "Makit" the perfect gift for any occasion! Free Back to School Printable‏s - Perfect for Those First Day of School Photos! First day of school photos are a tradition in this house! As much as I love spending the summer with my kids, I'm not nearly as excited for back to school as many parents I know. I do however want to capture all of their special moments to have as precious keepsakes and memories as they grow. I can't believe I'm going to have a 4th grader and a junior high (7th grade) student this year! Paper Coterie have the perfect "first day of school" photo printables. Just choose the grade year, print, and capture. It is a great opportunity to snap a shot to document all of the excitement and anticipation of what the year may bring that you can look back on for a lifetime. A few days ago I heard rumors of a great Kohl's coupon available for kids apparel. With back to school right around the corner, I was determined to find the $10 off $25 Kohl’s coupon and go shopping. I found it and was even able to combine it with my current 15% off coupon for even greater savings. I'm thrilled to say that after this little shopping trip, there is only one item left on my back to school shopping list - a new pair of shoes for my daughter! Let's face it... potty training and bedwetting are two battles that every parent dreads, especially mom. Not only can it be a daily struggle but often times it turns into a battle for both mom and child. GoodNites Underwear are the most absorbent pants for boys and girls ages 4 and up. GoodNites are specially made to protect while your child is lying down, so they help keep pajamas and bedding dry all night long and feature plush comfort with a discreet design. GoodNites are easy to pull on and off, are made of soft, comfortable, flexible and most important absorbant material, and don't leave your child with a bulky bottom. They can easily be worn both at home or for a little extra security while traveling. They also come in a variety of fun designs that make wearing them fun for children. 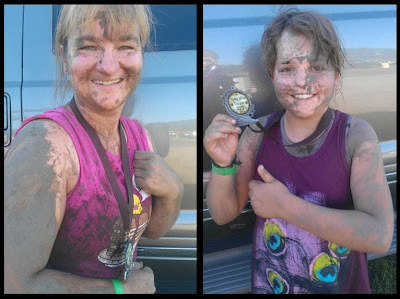 #FuelABetterYou with Nutrisystem Sweepstakes - Fuel Your Goals. Fuel Your Greatness! A year ago this July I began my journey to lose weight and lead a healthier life with the help of Nutrisystem! In my seven months on the Nutrisystem plan I managed to lose 55 pounds and over 40 inches, dropping from a size 16 to a size 8! Nutrisystem has been helping people (men and women of all ages) lose weight for over 40 years, and has paved the way for a new breed of weight loss companies with the introduction of live counseling by phone or online, replacing traditional customer visits to centers, and creating a new way for people to deal with weight issues privately. By delivering quality food and meal programs directly to their customers’ doorsteps, Nutrisystem provides a convenient way to learn how to lose weight and live healthier. And with over 150 perfectly portioned® entrees and snacks on the menu, you’re sure to find all of your favorites. They also offer vitamins, supplements, cookbooks and a host of other tools created to maximize weight loss success. 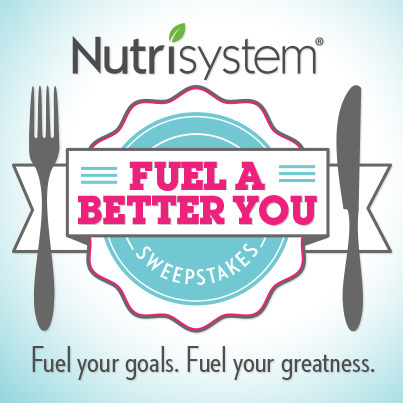 Nutrisystem has recently launched their Fuel A Better You Sweepstakes, and their prizes are sure to fuel your interest! I am now a father of two children so I have to say the idea of working from home sounds very appealing. Now I know what you’re thinking, “How much work are you realistically going to get done with two young children in the house all day?” I agree, and I’m not crazy. The kids would still definitely go to a day care it’s just that if I was working from home my hours would become much more flexible. Meaning I could help my wife immensely by picking the kids up and dropping them off, along with helping out on a few things around the house like dinners or laundry. Yes, I am a good husband. 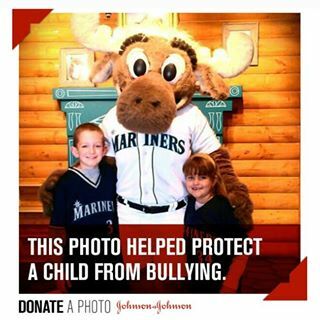 "Selfless Selfie" Donate a Photo Initiative with Johnson & Johnson! Get the Free App, Donate to a Cause & Make a Difference! Do you enjoy taking selfies? What if I told you that you could make a difference in the life of a child simply by sharing one (or more) of your selfies, would you take the time? By take a "selfless selfie" (pictures you take of yourself), you can help your favorite nonprofits. You’ll raise money and awareness, and help your cause meet their goals. 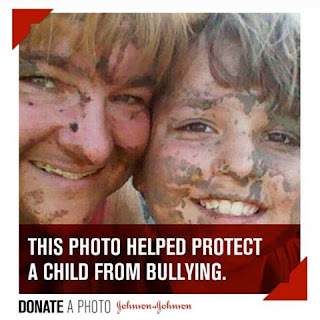 For every "Selfless Selfie" photo you share, Johnson & Johnson will donate $1 to the cause you want to help - a cause that does things like fix up a public park, get medicine for an infant, or help kids play sports safely. 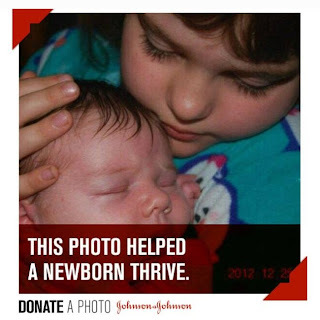 You choose the cause you want to help, Johnson & Johnson makes it happen. One cool thing about this initiative is that once a cause reaches its goal, another takes its place! The causes that have reached their goal stay in the app, so users can continue to learn more about the organizations and see the photos that helped support them. 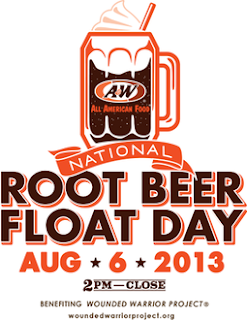 If you're looking for the perfect way to cool off on a hot summer day, or give your kids and yourself a sweet treat - be sure to head on over to your local A&W between 2 pm and close for a free root beer float on National Root Beer Float Day. As a part of the celebration, A&W will be collecting donations to honor and empower wounded warriors across the country through Wounded Warrior Project. Let me ask you a questions for all of you South Floridians out there. How hot is it in South Florida in July? No answer necessary, I know because I live here, but for everyone else pretty much all over the United States they have no idea. I have friends out on California that cry and complain about how hot it is there. And most of my friends don’t even live in the San Fernando Valley. 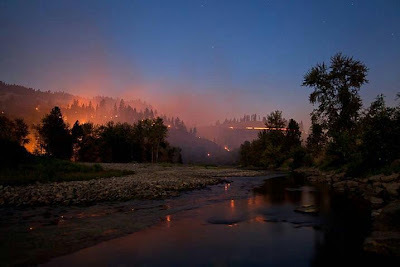 But even if they did live over ths hill in the valley they still have no idea about the heat. They try to tell me but I’m not buying it because there is zero humidity, I mean zero. So it can’t possibly be that hot. 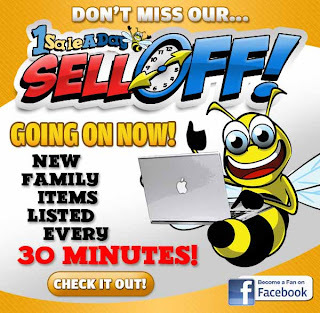 1SaleADay Family Sell-Off - Amazing New Deals Every 30 Minutes! I'm a huge fan of 1SaleADay and this is the perfect opportunity to stock up on great deals for your home, family, and possibly even get some of your holiday shopping done early this year! 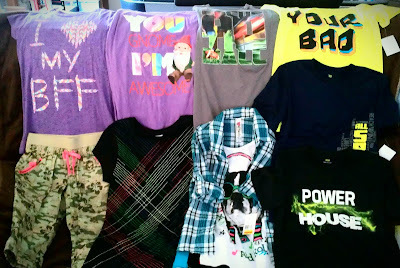 Kohl's $10 off $25 Kid's Apparel Coupon - Perfect for Back to School Shopping! The beginning of August means that school is going to start before we know it! That means getting in as many summer memories as possible and back to school shopping! Right now you can save a little more on back to school shopping with this Kohl's $10 off $25 kid's apparel coupon! Stack it with a percent off coupon for ever greater savings! 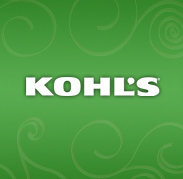 This $10 off $25 Kohl's coupon offer is valid through August 18, 2013. When do you start your back to school shopping? Noxicare Natural Pain Relief Cream Product Giveaway - 2 Winners! Noxicare Natural Pain Relief is a breakthrough natural, patented pain relief formula that is a proprietary combination of 7 of the world’s most potent natural pain relievers that quickly and effectively alleviate inflammation, muscle aches and nerve pain (burning feet) — with NO known side effects and without a prescription.